Aspen trees (Populus tremuloides) are small to medium-sized trees. The leaves on these deciduous trees flutter in the slightest breeze, creating the appearance of trembling or quaking. In nature, aspen trees quickly cover areas of the land lost to forest fires, erosion and logging practices. Because of their interesting appearance, as well as their ability to grow rapidly, aspen trees make good choices in many landscape designs in areas with cool climates. Prepare the soil for your aspen transplant. Choose an area that receives plenty of sunlight but receives protection from hot winds and excessive heat. 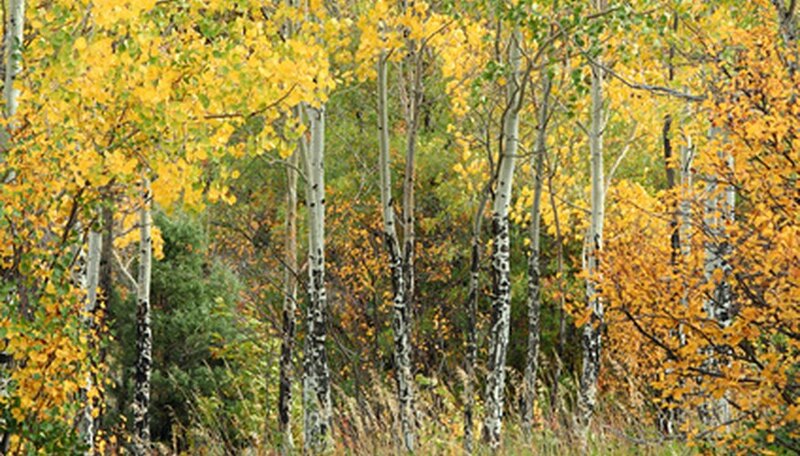 Aspens prefer slightly acidic types of soil that provide good drainage. Test the soil in your selected area to determine the pH level as well as the nutrient composition. Aspens require a pH level below 7 for optimum health. Purchase a soil test kit and follow the instructions for gathering the soil sample and adding soil amendments determined by the results of the test. Add organic materials, such as compost, to heavy soil. Loosen the soil in your selected site with a garden shovel, adding any required amendments and mixing well. Look for a healthy aspen tree to transplant. Aspen trees reproduce by suckers, making it easy to find small, manageable-sized trees among mature specimens. Select a healthy specimen by checking the leaves for signs of disease, such as black spots or curling edges. Choose a tree with an upright, uniform appearance. Set a burlap bag or large piece of fabric on the ground near your selected transplant. Dig up your chosen tree with a garden shovel. Allow plenty of room for the root ball, cutting through the single sucker root as far away from your transplant as possible. Place your dug tree, including a large amount of surrounding soil, in the middle of your burlap bag or fabric. Quickly pull up the edges of the fabric to encase the root ball. Tie the fabric around the trunk with a piece of string and slightly dampen the fabric to retain moisture near the newly dug roots. Plant your new aspen as soon as possible. Dig a hole in your prepared soil to allow adequate room for the entire root ball and the additional soil in your burlap bag. Set the tree in the hole to a level equal with the surrounding soil. Spread the roots along the bottom of the hole and backfill with soil. Gently tamp down the area around the base of the tree to eliminate pockets of air in the soil. Water your transplanted aspen tree after planting. Aspens require slightly moist soil at the depth of the roots. Check for this by digging a few inches below the surface of the soil near the base of the tree. Water often enough to maintain slight moisture at this level. Pile raked leaves and old straw near the base of your aspen tree during the fall to increase organic matter in the soil for spring growth. Check with your local forestry service or bureau of land management regarding necessary permits for removing aspen trees from public lands.